In the framework of the cycle “Outdoors. Three contemporary narratives of fragility: Isabel Banal, Domènec and Toni Giró” curated by Jordi Font. 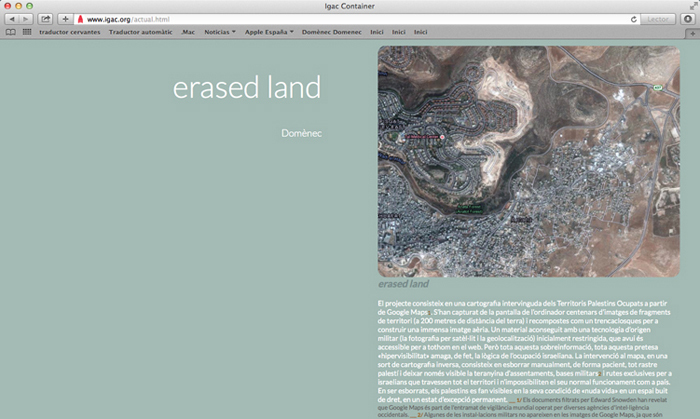 The project consists of an intervening cartography of Occupied Palestinian Territories from Google Maps (1). 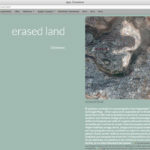 The hundreds of images of fragments of territory (200 meters away from the ground) have been captured on the computer screen and recomposed as a puzzle to build an immense aerial image. 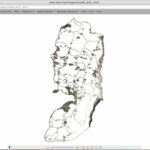 A material obtained with a technology of military origin (photography by satellite and geolocation) initially restricted, which is now accessible to everyone on the web. But all this over-information, all this alleged “hypervisibility” hides, in fact, the logic of Israeli occupation. 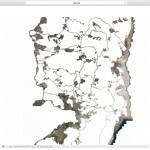 The intervention on the map, in a kind of reverse cartography, is to manually erase all Palestinian traces and leave only visible the web of settlements, military bases (2) and exclusive routes for Israelis that cross the whole territory and make imposible its normal functioning as a country. In the act of being erased, the Palestinians become visible as “naked life” in a void space of law, in a state of permanent exception. 1 / The documents leaked by Edward Snowden have revealed that Google Maps is part of the global surveillance network operated by several Western intelligence agencies.